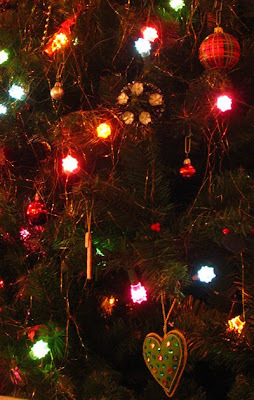 Mes meilleurs voeux à tous pour 2009! 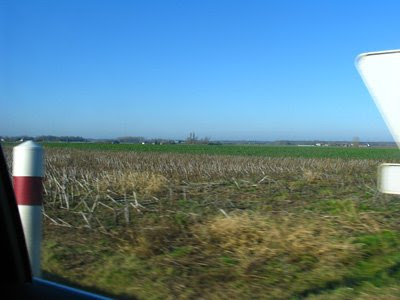 Hoping for a more plentiful harvest in the Loire in 2009, no frost and a proper summer. Also that the economic crisis is not as bad as many of us fear. A fiendish end of 2008 quiz? A glass of what exactly? Dry Oloroso, a Madeira, a white Loire, a pale tawny Port? To the Clos Roche Blanche (AC Touraine) yesterday afternoon to taste the 2008s with Catherine Roussel and Didier Barouillet. As usual the welcoming committee – the dogs Margot and Pif – were already out as we arrived. Sécotine, the very friendly striped cat, and Pélagie, the wild black one, were also in attendance – Pélagie only briefly. Before tasting we chatted with Catherine and Didier, who was getting a consignment ready to go to the States. 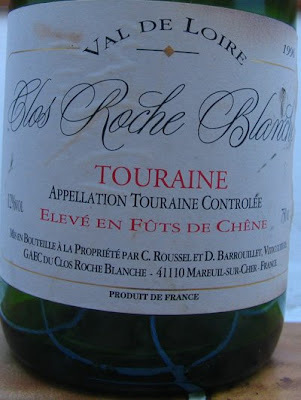 Around 50% of the Clos Roche Blanche’s production now goes to the States. Although with the current economic crisis, sales are dropping fast everywhere. We talked about retirement – Catherine and Didier are cutting back from 18ha to 9ha, also about Joe Dressner and his amazing Captain Tumour Man blog. 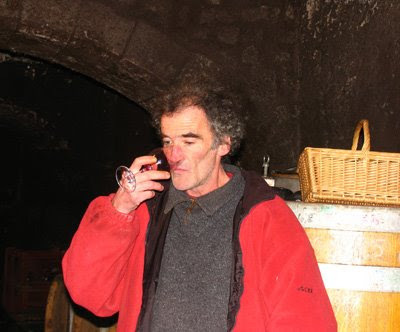 Apparently Joe is hoping to get over for the Salon des Vins de Loire at the beginning of February as his course of treatment will have finished by then. We also talked about the recent 4th edition of the Fête du Coin, featuring 20 vignerons, held this year at Chitenay over the weekend of 6th/7th December. Depsite la crise this edition attracted 700 visitors who bought a total of 6000 bottles. We started the tasting of the 2008s with several Sauvignons at various stages of development with several still fermenting. The 2008 whites have high alcohols, which has made Didier’s winemaking job difficult along with the need to lower the high acidities of 2008. The still high levels of acidity at the end of September meant that alcohol levels were high by the time the grapes were ripe. One of the Sauvignon vats is at 14.5˚. what proportion of the 2008 vintage this glass represents. Of the four vats I tried I liked the first one best. It had finished its alcoholic fermentation but hadn’t been through malo. 13.8% alc and 5.5 acidity, it had very attractive grapefruit flavours – very precise. Didier explained the various methods he had used this year to reduce the high acidities. These included maceration carboniquee, 15 days of cold stablisation and allowing a ‘voile’ to develop on the surface of the Sauvignon, as they do in the Jura. I thought this might be the same as the flor that occurs in Jerez but apparently it is different. Next up a lemony and quite weighty Chardonnay followed by a slightly fuller coloured than usual Pineau d’Aunis rosé, which still has some 10 gms of residual sugar. Next onto the Gamay, which at 22 hl/ha, was the most generous yielding variety in the very small harvest of 2008. The 2008 Gamay has lovely spicy, black fruits and will be delicious. The second and last red was the rich, concentrated, deep coloured and spicy Pif – 50% Cabernet and 50% Côt. Sadly due to the penurious vintage there will be no Pineau d’Aunis Rouge, no pure Côt or Cabernet. As we had enough foie gras from the Ferme du Prieure in Pocé-sur-Cisse for a first course, so what to drink with it? 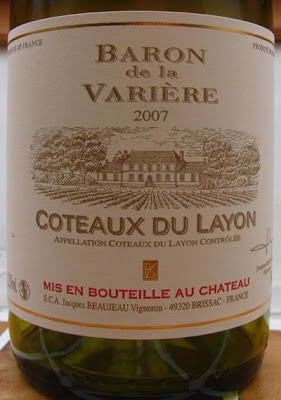 I opted for the Baron de la Varière 2007 Coteaux du Layon from Jacques Beaujeau in Brissac-Quincé. This youthful, reasonably rich and honeyed but not over-rich Layon worked very well with the foie gras. Although I have to say that this foie gras was over-salty and nothing like as good as the foie-gras we bought in Loches market from Michel Dufour of Mouzay (02.47.92.37.23) on Christmas Eve which was really excellent. However, the range of duck patés from the Ferme du Prieure are very good. The Baron de la Varière 2007 was one of some bottles that we bought at the Foire aux Vins held in the Champion store in Faverolles-sur-Cher at the end of September. This seems an appropriate moment to post a short profiile of Jacques and Anne Beaujeau and Château la Varière that I wrote for Decanter magazine earlier this year to mark them winning the Decanter regional Loire sweet wine trophy for 2008. Just across the road from the imposing renaissance Château de Brissac is the immaculately kept Château la Varière owned by Jacques and Anne Beaujeau. With its gravelled driveway and beautifully kept barn and other outbuildings this 100 hectare estate is one of the showpieces of Anjou. The property dates from the 15th century and the barn, one of the oldest buildings, serves as the red wine barrel chai, while a slightly more recent building is used for the whites – dry and sweet. 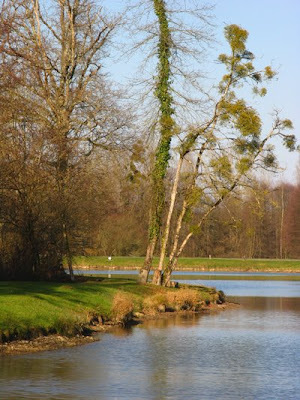 Having owned the property since 1850, the Beaujeaus are well established in Brissac. 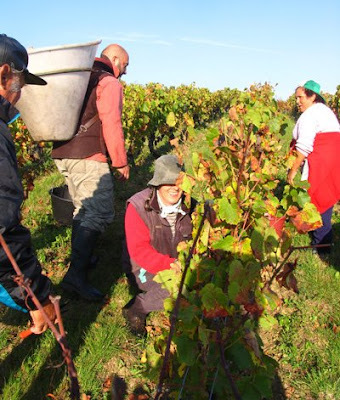 However, in comparison to some of the other local vignerons like the Daviau family at Domaine de Bablut in Brissac since 1546 and the Richous (Domaine Richou) present in Mozé-sur-Louet since 1554 they are newcomers. When Jacques Beaujeau took over the family estate in the 1970s they had 45 hectares of vines. He has more than doubled its size. Also in 2002 Jacques bought the 43-hectare Domaine de la Perruche at Montsoreau in the Saumur-Champigny appellation. 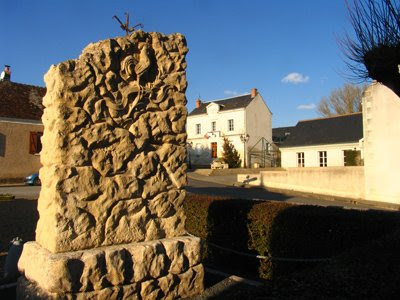 Perruche also produces Saumur Blanc, Coteaux de Saumur and Saumur brut from Chenin Blanc. At Varière they make the customary range of Anjou wines in all three colours including a very good Anjou Villages La Chevalerie made from 100% Cabernet Sauvignon. In 2005 the 2003 won the DWWA Regional Loire Bordeaux varietal over £10 Trophy. 2005 was one of those idyllic vintages when the autumn weather was so good that producers could wait until the optimum moment to pick. 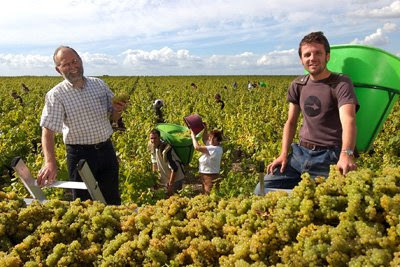 Normally, of course, harvest time is stressful and pressurised but in 2005 I have never seen the Loire vignerons so relaxed during le vendange..
We had two Bonnezeaux entered in the Decanter World Wine Awards tasting. The other was also Les Melleresses Château la Varière but from 2003. Although the 2003 is very rich and full, we preferred the balance and finesse of the 2005. Both are very fine and can be enjoyed now. However, they will live for decades and it is quite possible that as the richness of the 2003 mellows with time that it will long term be the greater wine. It will be fascinating to see how the two develop. Here are the dates for a series of fêtes that will celebrate the Loire in the summer of 2009. 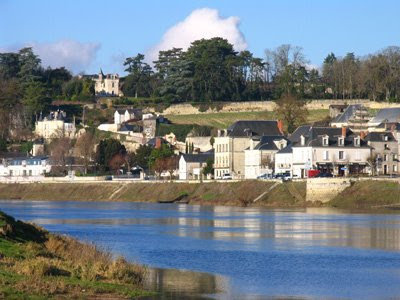 They start on 23rd June @Sully-sur-Loire. 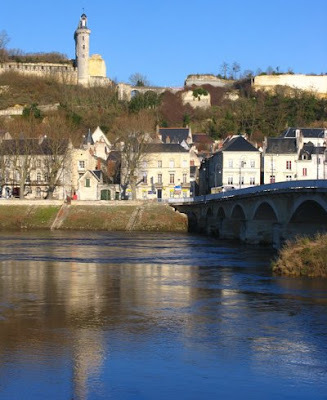 Next it will be the turn of Amboise on 27th June when there will be a giant picnic on the bridge. 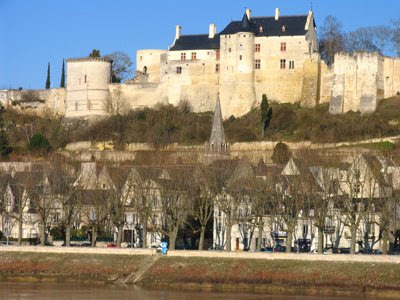 Saumur follows on 4th July and the fourth and final fête will be at Chalonnes-sur-Loire on 9th July. 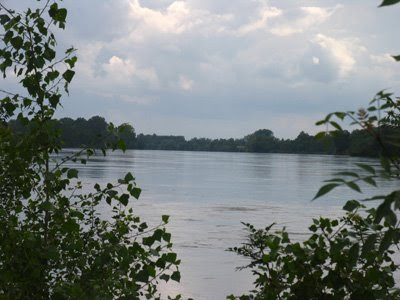 Let’s hope the organisers have better luck than they did this year when the Fête de la Loire at Tours had to be canceled due to the violent storm of 31st May. 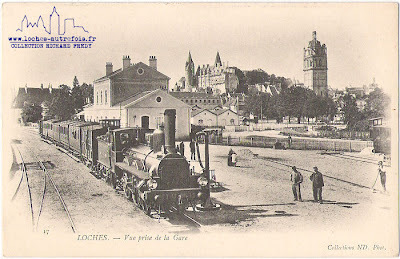 Fredy Richard, who lives in the town, has recently launched a site that features 1200 old postcards of Loches and its surrounding area. 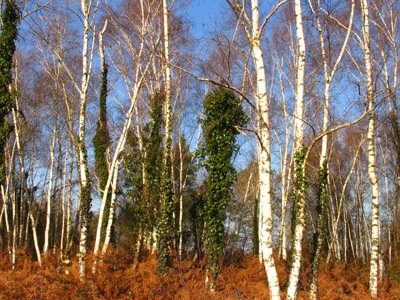 Most of them come from the turn of the 20th century and are classified by various categories. Fredy is still collecting and intends to add more cards in the future. 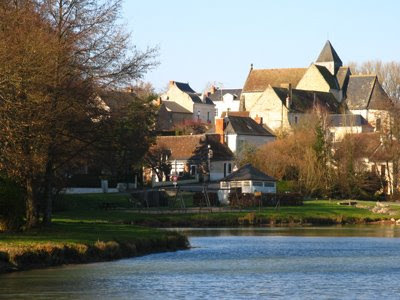 Loches is a popular and bustling market town on the River Indre in southern Touraine. It is famous for its château and its donjon, where prisoners were incarerated in appalling conditions. Nowadays Loches has a very good market on Wednesday and Saturday mornings. Tried another Pinot Noir from the Central Vineyards last night. 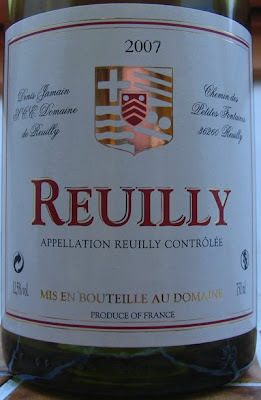 This time a 2007 Reuilly Rouge from Denis Jamain’s Domaine de Reuilly. Light to medium-bodied with bright, youthful red fruits this very enjoyable and easy drinking wine turned out to be a perfect match with a rissotto con radicchio. An instance of where a lighter style red works well where a heavier, more structured one would have overpowered the risotto. I haven’t yet visited the domiane but from a search on the net it has 15 hectares of vines: 10.5 ha of Sauvignon Blanc, 3.5 ha of Pinot Noir and a hectare of Pinot Gris. 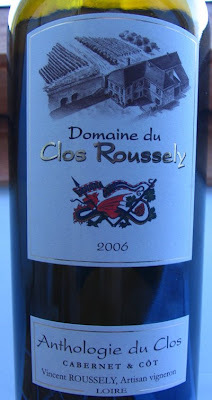 Denis Jamain, Domaine de Reuilly, Chenin des Petites Fontaines, 36260 Reuilly. We had a very enjoyable lunch with Jean-Ernest Sauvion (formerly Maison Sauvion/ Château du Cléray and now retired to western Touraine). 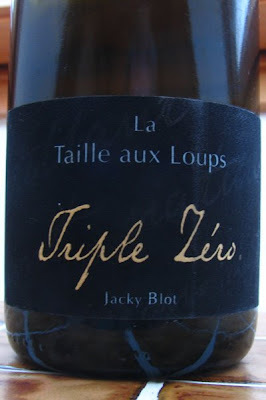 Jacky’s Blot’s Triple Zero as the aperitif was followed by the 1996 elevé en fûts de chêne from the Clos Roche Blanche AC Touraine. This blend of Cabernet, Côt and Gamay is now called La Closerie. The 1996 continues to show well with good, evolved black fruit flavours and structure with some acidity in the finish. It worked well with a salad of goats’ cheese, lardoons and mushrooms. Although a surprise for those who think straight AC Touraine wines don’t age, however I don't think the 1996 will improve further. 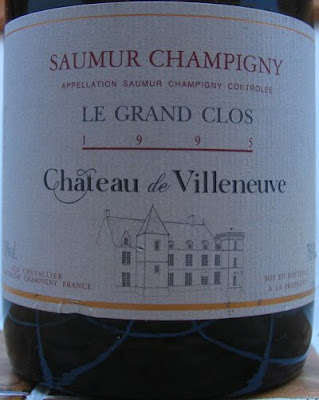 “A step up in quality,” was how Jean-Ernest described the 1995 Grand Clos Saumur-Champigny from Château de Villeneuve. Partnered with an adapted boeuf-bourgignon, the 1995 was particularly delicious with its fragrant black fruits and cedar notes and good concentration. Probably at its peak now but should remain at this level for some time. So excellent was Le Grand Clos that you have to wonder why you would want to pay the large sums necessary to find the equivalent in Bordeaux. Equally it would be fascinating to put this blind against top Bordeaux. English cheeses – Montgomery’s cheddar and Stichelton, an unpasteurised ‘Stilton’ – followed. Stichelton can’t be called Stilton because it is made from unpasteurised milk and sadly Stilton now has to be made with pasteurised milk. Both cheeses came from Neal’s Yard Diary in London. The long and delicately honeyed 1976 Haut-Lieu Vouvray moelleux from Huet was perfect with the cheeses. Complex aromas and flavours have now replaced some of the Haut-Lieu’s initial sweetness. I bought a number of bottles of the 1976 during the 1980s and have found that the corks have been problematic – some of the levels on the bottles are quite low. Indeed one I tried about six months ago was only just over half full. Much to my surprise the remaining wine was still drinkable. A tarte tatin demanded something sweeter than the 1976 Haut-Lieu Moelleux, so I chose the rich and honeyed 1990 Vouvray Moelleux Cuvée des Deronnières from Pascal Delaleu, Domaine de la Galinière in Vernou. 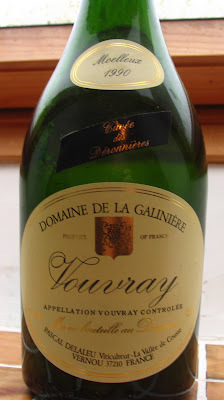 Unlike a number of 1990 Vouvrays its colour was still light gold as quite often 1990s have developed a surprisingly deep golden colour. 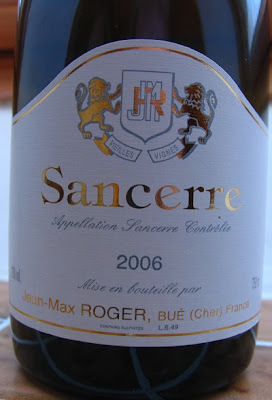 It can be easy to overlook the length of time that Jean-Max Roger has been making good red Sancerre. Long before Alphonse Mellot jnr joined Alphonse snr in 1993 and then proceeded to produce transform the Mellot reds, Jean-Max was producing fine, age-worthy reds. I remember with pleasure the 1989 and 1990 vintages. These have never been blockbusting Pinots. Instead medium weight with good concentration of ripe fruit and well balanced. The 2006 Vieliles Vignes is in this same line with an attractively bright colour, soft raspberry fruit but with enough structure to allow it to age well, although it is delicious and seductive now. Although I’m not all sure about Pouilly-Fumé being the ‘pearl of the Loire’ given its variable present day quality, this is an informative and interesting study of Pouilly-Fumé. I’m finding the chapter, written by Patrick Coulbois, on its history particularly interesting. As in Sancerre there were some red grapes planted here before the arrival of phylloxera at the end of the 19th century, although unlike in Sancerre red varieties were never the majority. Instead it was Chasselas and Sauvignon Blanc that dominated. As Coulbois explains in the chaopthat Sauvignon Blanc had already established its reputation in Pouilly at the beginning of the 19th century. Pinot Noir was planted in Pouilly along with Gascon, L’Oeillade plus other red varieties including I assume Gamay. 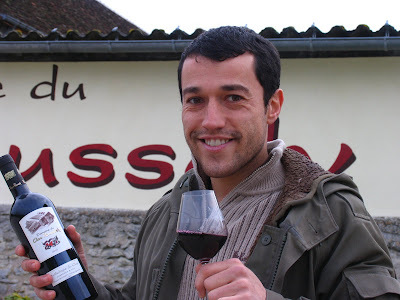 Claude Courtois in the Sologne has a vineyard of Gascon – click here for details and L’Oeillade is a synomym for Cinsault, although it would be surprising if this variety was planted so far north. Perhaps this was a different variety. Would like to hear from anyone who knows. 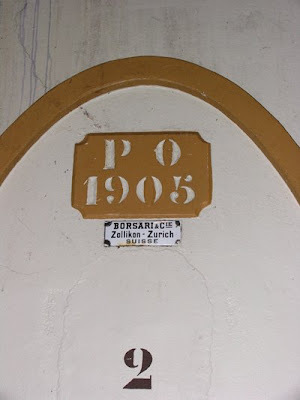 In 1793 un poinçon (223 litres – nearly the equivalent of today’s barrique) of Pouilly sold for 134 livres. This compared to 100 livres for Sancerre and 84 from wine from Cosne – now part of the Coteaux de Giennois. 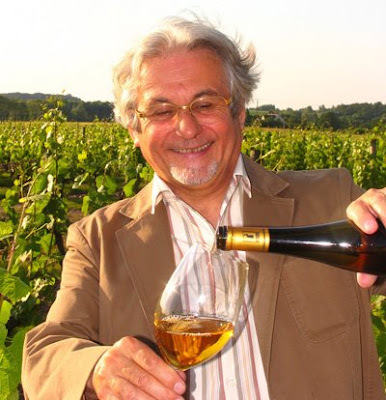 Red wine from Pouilly sold for 90 livres. In 1829 there were 1890 hectares in the region of Pouilly. After phylloxera and two World Wars this had fallen to just 430 hectares by 1970. There are now 1224 hectares planted. 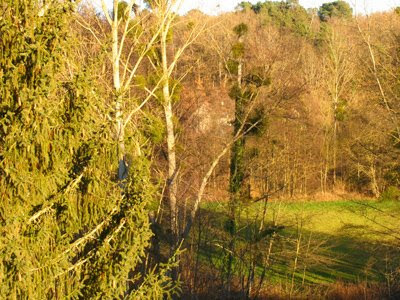 Throughout its history Pouilly has experienced good and bad times – years of prosperity and years of misery as Coulbois recounts. 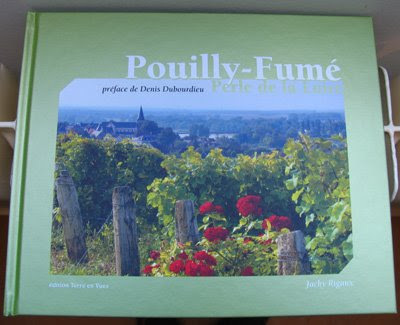 There are also useful chapters on the soils and geology of Pouilly. Unfortunately the chapter on the evolution of the vineyard in recent times is stronger on poetry than on substance. In the photo chapter on the vignerons of Pouilly appears to be missing some significant figures: Didier Dagueneau (no surprise here), Patrick Ladoucette and Jean-Louis Saget. Pouilly-Fumé was published in 2007 by terre en vues 34€. It includes a number of very fine photos from a number of contributors. Having made fish cakes with what remained with the salmon trout, we had this as a quick brunch before our celebratory meal starting in the late afternoon. 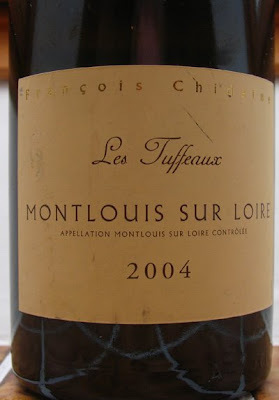 Although quite rich – tendre/demi-sec – François Chidaine’s Les Tuffeaux 2004 provided a good match, especially as there was sufficient acidity to carry off the touch of sweetness. For the aperitif I had intended to have Domaine Huet’s 1999 Pétillant but on discovering that there was only one bottle left, we had Jacky Blot’s Triple Zero instead, which naturally was no hardship. The salad of foie gras de canard as the first course presented some problems. Initially I considered a sweet wine – something from the Layon or l’Aubance. However, I rejected this option as the foie gras was part of a salad and not being served alone. Chidaine’s Les Tuffeaux would, I suspect been ideal but we’d already opened that, so I selected Mark Angeli’s 1998 Vieilles Vignes des Blanderies. However on opening it, delicious as it was and would prove to be a couple of days later as an aperitif, I wasn’t convinced that its oxidative style would be the best match with the foie gras salad, so instead opted for a bottle of 1998 Les Cormiers Château de Villeneuve that had both the weight and vivacity to be complemented by the salad. 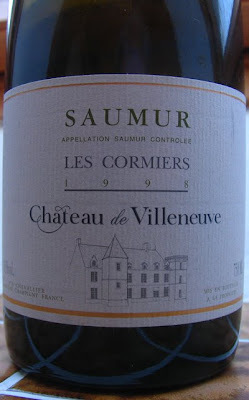 1998 was the least good Loire vintage, especially for reds, of the second half of the 1990s. However, both Mark Angeli's and Jean-Pierre Chevallier's 1998s showed well and both could be kept for a severalo years more. Traditional turkey and ham partnered by two red Burgundies – not Loire I know but they do use the same grape variety as Sancerre. First up a 1986 Nuits-St-Georges 1er Cru from Léonce de Valleroy – some charm but now needing to be drunk. Then a 1996 Nuits St-Georges 1er Cru Les Boudots from Maurice Chevallier, showing more concentration and which could be kept a while longer. 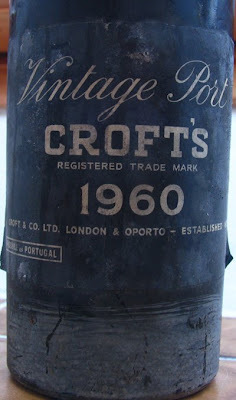 We finished with a 1960 Vintage Port from Croft, which on Christmas Day was quite spirity but when finished off on 27th had mellowed with the spirit properly integrated. Interesting that, despite the diversity of Loire wines, there has never been a tradition of fortifying them. 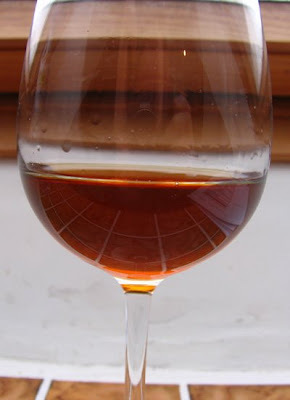 Fortified wines I guess tend to come from hotter climes, producing more potential alcohol and therefore better adapted to stopping the fermentation, as in Port and Vins Doux Naturels. It is curiously difficult to get statistics out of the Syndicat General des Crémants Vignerons Producteurs de Crémant de Loire – they seem to treat figures as state secrets. Anyway here are some figures for the production of Loire sparkling wine in 2007 showing the production of Crémant finally taking the number one position from Saumur. Total production in bottles: 39,444,125. The Loire's total sparkling wine production is only 11.5% of that of Champagne, where 338.7 million bottles of Champagne were produced in 2007. However, permitted yields in Champagne are substantially higher than they are in the Loire. 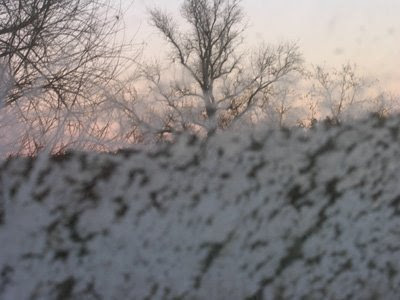 Frost on the window at sunrise. Outside temperature –3.5 C at 8am, so presumably colder during the night. Fortunately dry, so the roads are not icy. Cold day with a biting north east wind but bright, clear blue skies and wonderfully intense light. 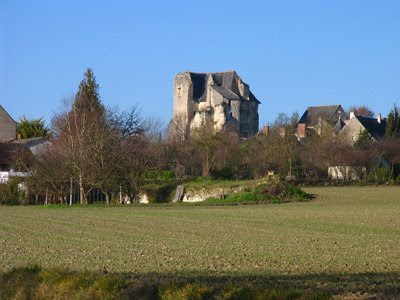 Epeigné is a small village of just under 400 inhabitants on the eastern limit of Indre-et-Loire, close to the départment of Loir-et-Cher. Vines used to be quite important here and, while there are some vineyards left, the area under vine has declined substantially over the past 20 years, as producers have retired and taken the subsidy for rooting out their vines. 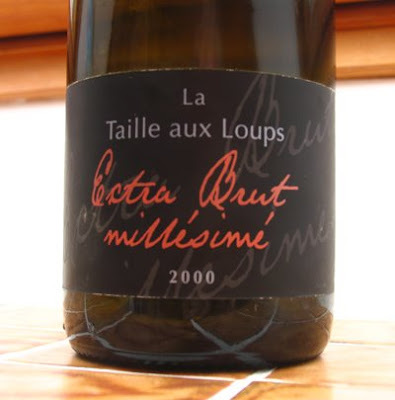 Family dinner for eight starting with Jacky’s Blot’s 2000 Extra Brut Millésimé La Taille aux Loups – nicely rounded out and developed from its additional time in bottle – some toastiness and a hint of honey. The 2007 Château du Cléray Muscadet Sèvre et Maine was brilliant with the first course of prawns having both weight and freshness but without sharp acidity. There was some surprise that Muscadet can be this good. The 2007 can clearly be drunk with pleasure now but should happily last for a good five years. 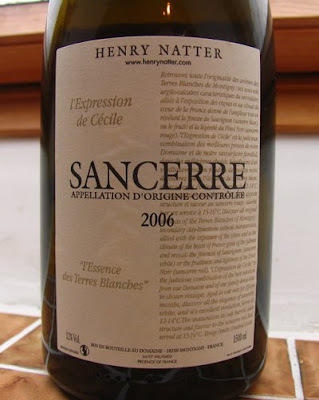 A magnum of the 2006 Expression de Cécile Sancerre Rouge from Henry Natter was perfect with the baked salmon trout – the wine’s soft red fruits being a fine foil to the trout’s quite delicate flesh. An illustration of how good a medium-bodied Sancerre red can be with some fish. 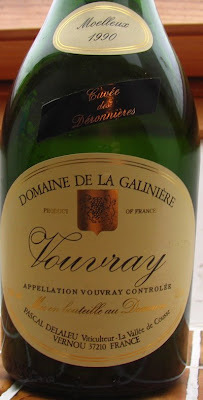 Then with the Tarte de Cambrai made with pears following the recipe in Jane Grigson’s Fruit Book, we finished off the 1990 Vouvray Moelleux Cuvée des Deronnières from Pascal Delaleu Domaine de la Galinière in Vernou. Fortunately we had booked because Le Pot was full. We kicked off with a coupe de Crémant de Loire Brut from Domaine des Varinelles, owned by the Daheuiller family and one Crémant de Loire Rosé from Domaine de la Petite Roche in Tremont, which is well to the south of Saumur. We were particularly impressed by the rosé. 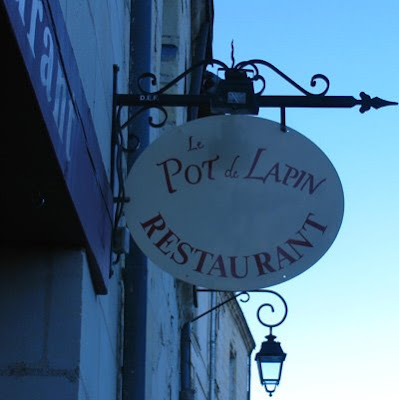 The four of us enjoyed four good first courses: compote de lapin, onion soup, feuillette de champignons and oeufs en cocotte, the house speciality. 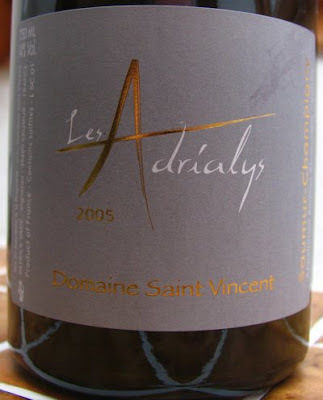 With this we made a start on our rich and pruny 2005 Les Adrialys, Saumur-Champigny, Domaine Saint-Vincent from Patrick Vadé. As well as making good reds, Patrick’s Saumur Blanc is often impressive. The problem at Le Pot is that there is such a choice of interesting wines on the wine list that selection is not easy. Patrick’s rich wine went particularly well with the deliciously tender biche aux girottes that two of took as well as the fine ris de veau à la crème that the other two took. Profiteroles au chocolat followed by coffee completed an excellent meal. 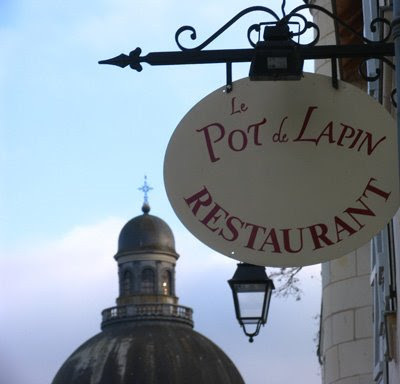 Le Pot de Lapin is great – just make sure you book, especially at lunchtime. 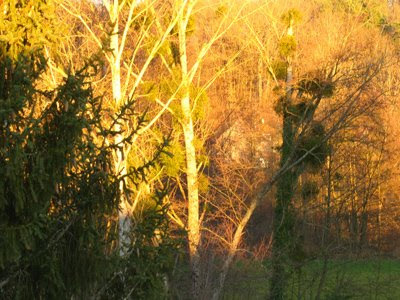 Contrary to the rather grey weather forecast, today was one of those brilliantly clear, sunny winter days. 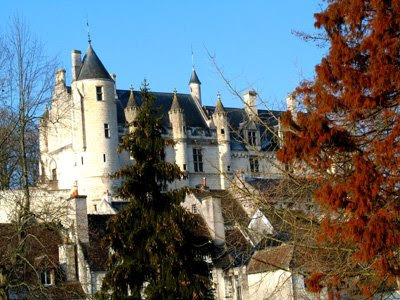 We headed off to Saumur via Mantelan, Sainte-Maure-de-Touraine and to Nohant-en-Touraine, where we turned off the direct route via Ile Bouchard to Saumur and made our way through Saint-Epain and down the very pretty manse Valley to Crissay-sur-Manse. 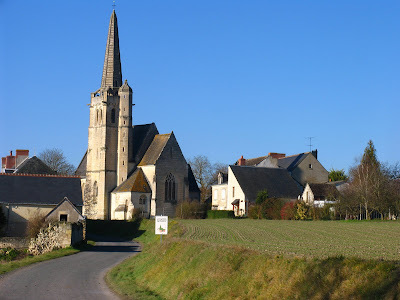 – one of the 'Plus Beaux Villages de France'. France has 151 villages in this category. 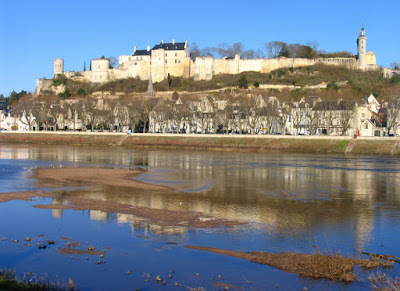 Then on through Panzoult, Cravant-les-Coteaux to Chinon, where I took some pictures of the old town and the château above along with the reflections in the Vienne. All the photos have almost improbably deep blue sky. (Domaine Luneau-Papin) taken during the 2008 harvest. 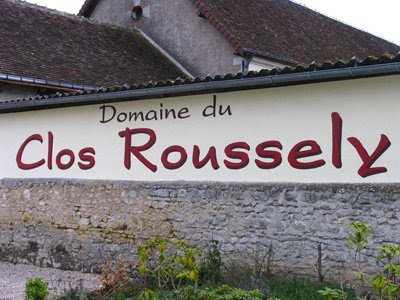 Although I have drunk some of the wines before, today was the first time I have visited Clos Roussely. There I met Vincent Roussely, who took over the domaine in 2000. Vincent has 22ha of vines. 14 here in Saint-Georges-sur-Cher, which he bought from a couple from Champagne when he set up in 2000. 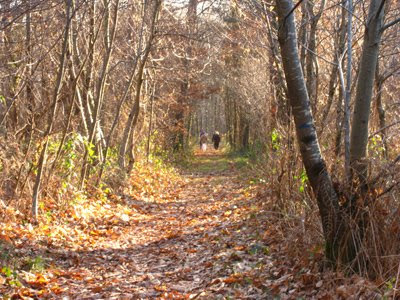 The property was previously called Domaine de la Chauverie. Vincent has another 8ha at the small village of Angé just a few kilometres further east down the Cher Valley. Angé is where the Roussely's have their roots. Mention of the family in the local archives goes back to 1650 and Vincent's grandfather and great-grandfather looked after the family vines here. His great grandfather was the first to train his vines rather than letting them grow as bush vines. Vincent did his training at Bordeaux and Reims and then spent time working at L’Avenir in South Africa, BRL Hardy in Australia and Moët & Chandon in California. Vincent’s father was a négociant in Angé but he sold his business in 1996. The deal included renting the cellars to the purchaser. This is why Vincent had to find new premises in which to vinify when he returned in 2000. 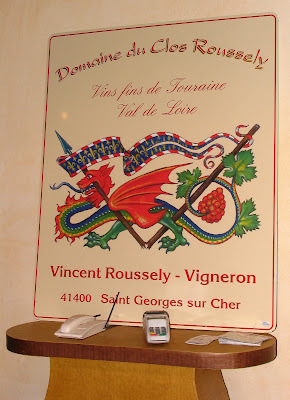 The cellars in Angé has just become free again, so the buildings of the Clos Roussely are now up for sale as Vincent intends in future to vinify at Angé in future. Starting in 2009 if he is able to sell building at Saint-Georges. The eight hectares at Angé are on the premier côte, which is principally limestone, and are planted with Sauvignon Blanc. The vineyards are in their second year of conversion to organic status and will be receive their certification next year. Vincent’s aim is for the vines at Saint-Georges-sur-Cher to be organic but he explains that this will be more difficult than at Angé because the soils here – argile-silex – are heavier with a higher proportion of clay. However, the vineyard is here is grassed over and weeds under the vines are kept under control by cultivation. We tasted his current range of wines and I was impressed with the attractively citric and gooseberry Le Clos Touraine Sauvignon 2007 (5.20€ retail from the domaine), the delicately floral and peppery 2007 Temps Danse – the rosé made from the old Pineau d’Aunis vines, and the delicate and fine Crémant de Loire – a blend of 80% Chenin Blanc and 20% Chardonnay. The base wine is from 2004 and spent nearly four years sur latte, which explains its finesse. Once again I was impressed by the Anthologie du Clos 2006, which I have already drunk on a couple of occasions. A blend of 70% Cabernet Franc and 30% Côt, this rich and attractively texture wine should age well over the next four or five years. Vincent has commissioned an interesting and attractive design, which includes a dragon representing Saint-George, the fleur de lys of France, a broken spear in a V – victory shape and vine leaves. Unfortunately on a number of his labels this is combined with a picture of the vineyard and cellars in Angé (see photo of Anthologie du Clos 2006 below) making the label rather cluttered and not taking full advantage of the quite striking design. Vincent is certainly another promising young producer in the Cher Valley and is certainly one to follow. 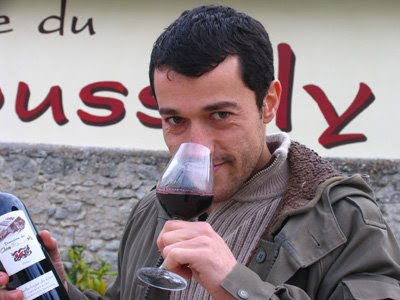 Vincent Roussely, Domaine du Clos Roussely, La Chauverie, 41400 Saint–Georges-sur-Cher.